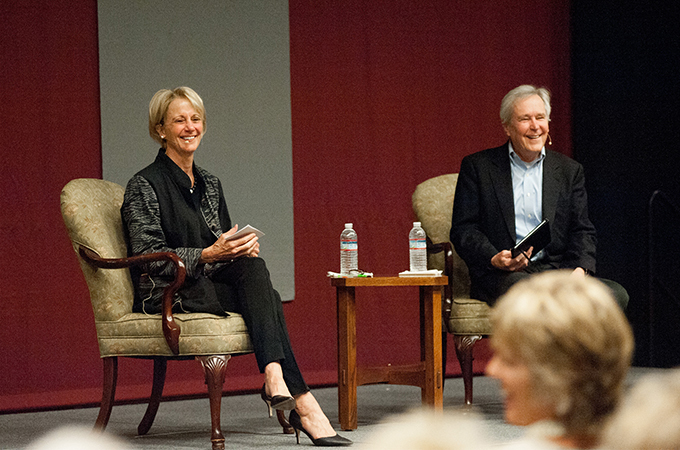 On February 19, the University of Redlands community had the pleasure of hearing authors, commentators, and U of R honorary degree recipients James and Deborah Fallows underscore the key role of the younger generation in creating change. Co-authors of the upcoming book Our Towns: A 100,000-Mile Journey into the Heart of America (Random House Publishing), the husband and wife duo encouraged young people (and the young at heart) to embrace their potential to address today’s social problems. Current college students, the millennial generation or Gen Z, are “extraordinarily networked” because of the rise of the internet, “incredibly creative,” and adept with working in groups and collaborating, she said. They are tapping into these qualities in the most recent social movements, including the demand for gun control reform. Deborah noted she was mesmerized by Florida youths’ ability to act constructively and demand change immediately after the Marjory Stoneman Douglas High School shooting on February 14. Deborah cited other examples of millennials working for change from the couple’s extensive travels across the country in researching Our Towns. Two millennials they met, Melissa Butler and Jeremy Boyle, used their backgrounds in education and engineering to create the Children’s Innovation Project, which teaches inner-city children in Pittsburg how to build, manipulate, and discuss circuitry. James took up the theme of the younger generation’s potential, noting a “historic opportunity on the gun issue.” “This issue is contingent on young people to take the lead,” he said. He offered two tactical suggestions to activists, drawing on experience from his days working in politics: writing “physical letters” to representatives (rather than emailing) can have an oversized impact; demonstrations also get noticed and encourage politicians to take a stand. The Fallows will be back in Redlands on Wednesday, May 16 as the only Southern California stop in the book tour for Our Towns. Tickets are available for the event, which will be held at 8 p.m. in the University’s Memorial Chapel.